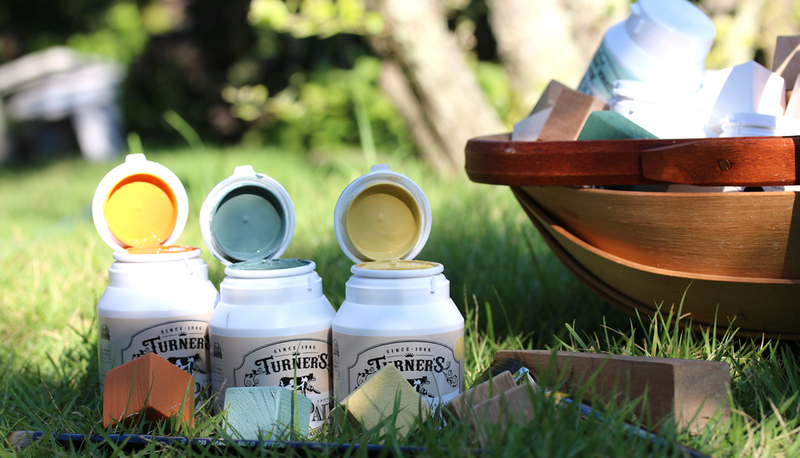 Made with natural ingredients an original and authentic paint perfect for furniture and other DIY projects. 1. 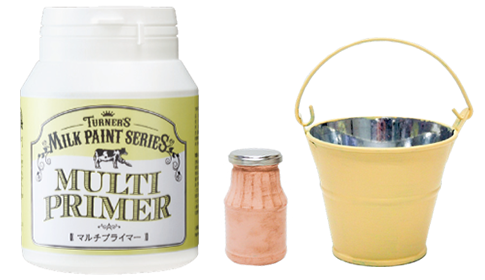 A natural paint made from raw milk by Morinaga Milk Industry Co., Ltd.
2. American classic colours are reproduced very closely. 3. Each medium is water-based and completely safe. 4. It is easy to use, spreads well with a creamy consistency. 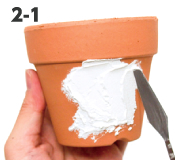 * Use a multi-primer for the first coat. PP / PE plastic in general, PVC soft materials. 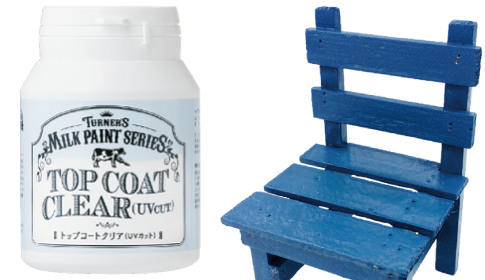 In Colonial America wood furniture was painted with paint made from milk protein (casein). 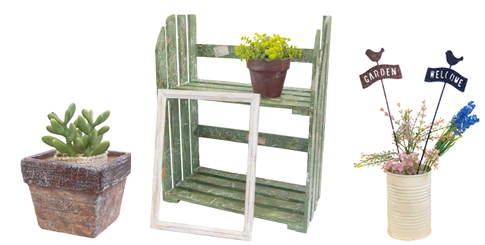 For colors of the earth or mineral pigments, soil, bricks, etc. (early American antique color tones). 1. 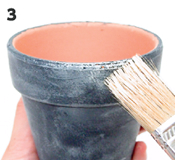 Remove dust, dirt or oil from the surface to be painted. 2. Stir well before use, use concentrate liquid only. 4. Do not paint too much at one time. Apply in two layers. 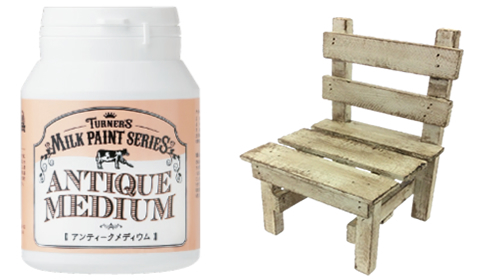 Milk paint gives a charming antique look, streaky or mottled appearance. After use, close tightly. Store away from direct sunlight, high temperature and high humidity. 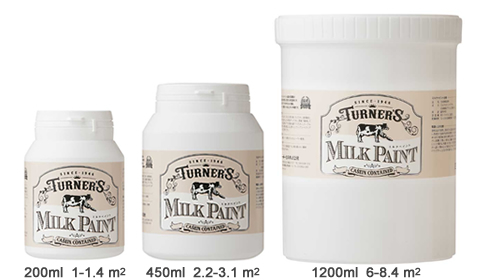 There is a risk of paint corruption, due to the raw material of milk. 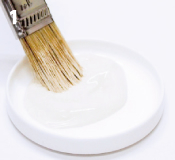 When painting table tops or other durable surfaces, use a top coat of clear (UV-cut) over the milk paint. Finished with an atmosphere of vintage taste. It is a thick dark brown medium. Can be painted over milk paint, once fully dried. Stir well before use, use concentrate liquid only. 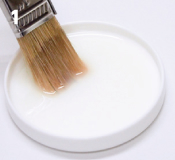 For large surfaces, put a small amount of medium on a cloth and apply rubbing thinly. 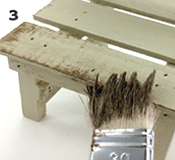 For small surfaces use a brush to create faded effects. * The final look depends on the amount used. Apply a thin layer initially, then build up colour to create the desired effect. * Scratch the surface before painting for a more realistic vintage look. 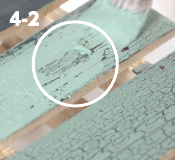 * Painting over the cracking or plaster medium is also possible. 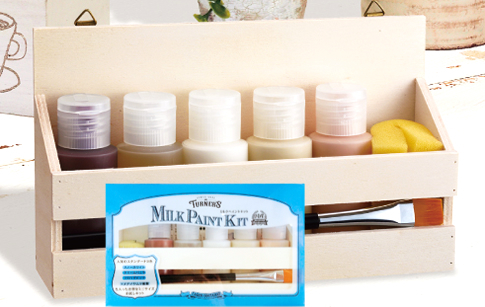 * It is recommended to paint a base coat of pale milk paint followed by a coat of antique medium. Finish with dust medium for a more realistic look. 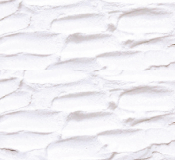 It is a thick white / beige medium. Can be painted over milk paint, once fully dried. Stir well before use, use concentrate liquid only. 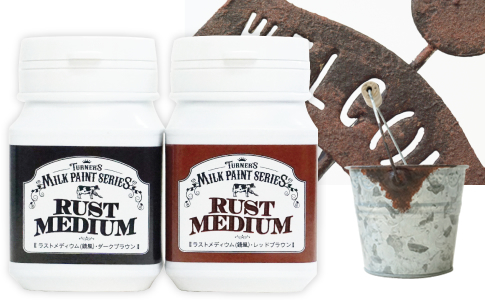 * It is recommended to paint a base coat of dark milk paint followed by a coat of dust medium. * The condition of dirty (faded) can also change the atmosphere upon completion. Apply a thin layer initially checking the extent of the colour. 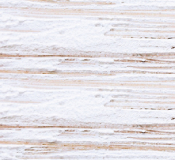 * To create a dusty white effect, use a darker base milk paint. Stir well before use, use concentrate liquid only. 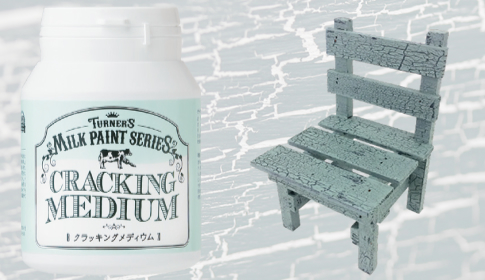 Paint with primer milk paint. 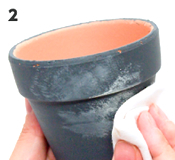 Once fully dried, apply the cracking medium and allow to dry until slightly sticky to the touch. 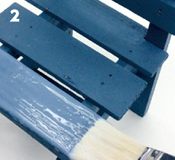 Paint on the final coat of milk paint (different from the primer colour) quickly and gently. * Cracks appear in the same direction of the brush strokes when finish. * Drying time is long, use a hair dryer for quick results. (Note) Cracking medium is not water-resistant. If required, please use an oil agent (weak solvent-based). 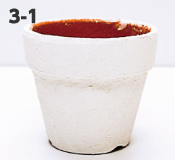 This medium contains white stucco and microscopic ceramic balloons in it. Stir well with a stick before use, use concentrate liquid only. Paint by parallel pressing, like spreading butter with a butter knife. Besides a painting knife, a flat wooden spatula can also be used. 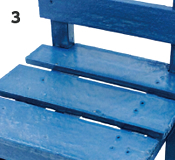 Apply milk paint when completely dry. Complete drying takes one to two days. 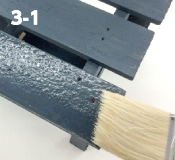 * It is also possible to use mixed with milk paint. 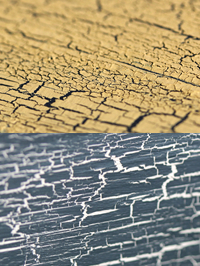 * Can enjoy a variety of texture depending on painting technique: scratching with a fork or press with wooden spatula. 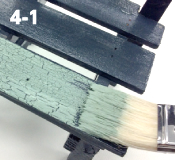 Improve the adhesion to painted surfaces. 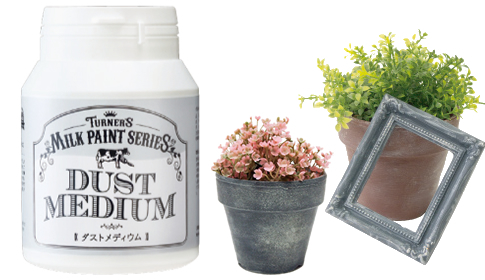 By using this primer, the adhesion of milk paint with paint resistant materials (metals, glass, plastic, etc.) will be improved. This milky white primer will be transparent after dry. 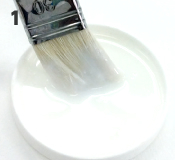 Stir well before use, use concentrate liquid only, but if you do not want the brush marks, dilute with less than 0-20% of water. 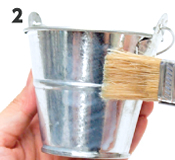 Paint 1 or 2 thin coats to avoid thick coating. 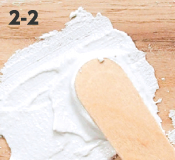 In case of concrete and mortar (porous surfaces) paint 2 layers. 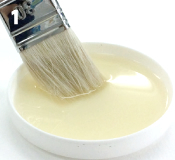 When the primer is dry in 2 hours (glass needs a day), apply the milk paint. *Adhesion to certain materials may be difficult. Improve the durability, give a gloss and protect from UV and finger marks. Let the primer to dry – it’s complete. For painting on metal, etc. 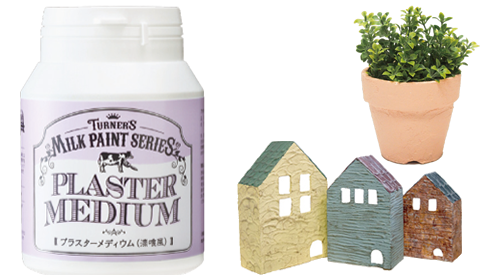 we recommend to use the multi-primer as a primer first. 1. It is a thick medium of brownish colour. Stir well before use, use concentrate liquid only. 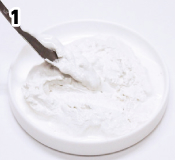 In case of need, if it is difficult to spread, dilute the paint with about 0 to 5% water and mix well. 2. 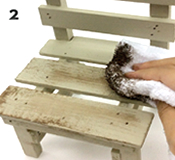 Use a brush apply the Reddish brown rust medium to the part where you want to express rust. 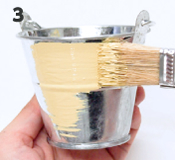 Hold the brush vertically, paint until the surface is covered. 3. By mixing red brown and dark brown you can make a neutral colour, apply it onto the surface with the same painting method as mentioned in 2. Do not cover the first layer colour completely. 4. Finally, paint the dark brown overlaps partly on 2nd layer. Try not to cover the second layer completely. 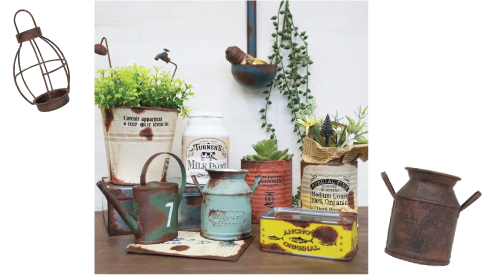 *To create a more realistic finish paint those parts where rust might appear on borders, metal fitting parts, seams of cans, tins or buckets. *For a better effect we recommend using such a rough pig hair brushes. 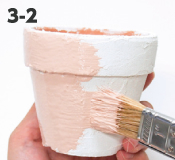 *For a better finish allow each coat to dry before painting. 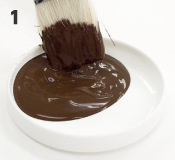 *Use the red brown and dark brown mediums and dab spots onto the surface, and then recoate with dark brown. Then partially apply the red brown to create the impression of rust.